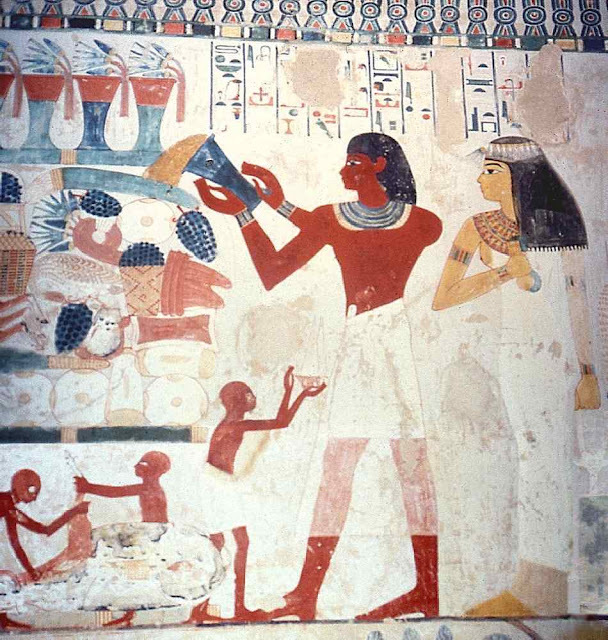 The eleven lines of text above the scene describe it as follows (the name of Amon having been removed three times) : "Offering all good and pure things, bread, beer, ox, poultry, long-horned cattle and short-horned cattle, which are placed on the altars [of Amon, to] Re-Harakhty, to Osiris the great god, to Hathor mistress of the necropolis, and to Anubis on his hill; (by) the serving-priest of [Amon, the scribe Nakht, justified], (and) his sister, his beloved, with a place in his heart, the chantress of [Amon, Tawy], justified.". The offerings rest on a reed mat, whilst above the many different items, as mentioned above, is another reed mat on which stand four vessels, no doubt for oil or unguents. Over each of these four vessels rest lotus blossoms, both in bud and in bloom. Nakht, bared-footed and with a shoulder-length black wig and no beard, is dressed in a short white kilt with a longer semi-transparent one over it. He wears wrist bracelets on each arm and a colourful broad necklace around his neck. In his hands he holds a vessel from which he pours the contents (incense oil, in the form of an orange mass) onto the pile of offerings. Tawy, also bared-footed and with a longer black wig around which is a broad head band adorned at the front with a lotus blossom, is dressed in a tight fitting white dress, which reveals her breast. Over the white dress is also a semi-transparent longer one, the bottom edge of which reaches over her feet. She wears four bracelets, one on each wrist and one on each upper arm. Her broad necklace is also colourful and very decorative. In her right hand she holds a menat necklace and in the other a musical instrument called a sistrum. Both of these were associated with the goddess Hathor and were certainly appropriate to her title as "chantress of Amon". 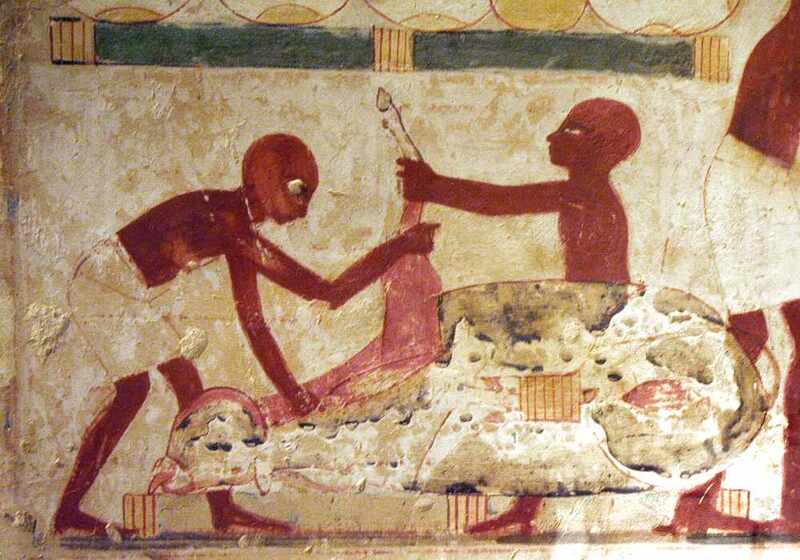 A sacrificial ox, which is lying a reed mat, is being dismembered by two men. The artist would appear to have made a very strange error: if the ox is lying on the mat, then the lower part of their legs should not appear in front of it, from behind the animal A third man is shown offering to Nakht a dish with two white cones of fat, presumably made from the animal being dismembered. Thanks for sharing information to us. If someone wants to know about Cabs In Ooty and Ooty Tour Packages. I think this is the right place for you!